Never fear, this one is easy to fix! 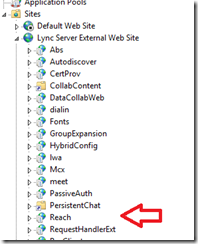 The application pool registered to the Lync Server External Web Site\Reach application is set to activate On Demand. This results in an IIS application pool that is not spun up when an external reach request is received resulting in a connectivity fault. Running IIS7.5? 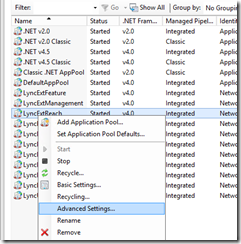 Don’t see the Start Mode in IIS, here is the manual method! Important: Make sure you are running your editor as an Administrator! 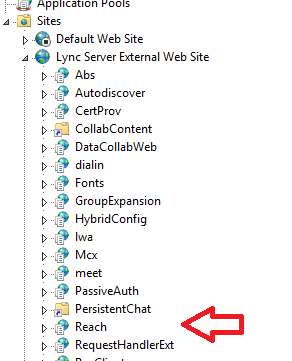 Important: You are looking for the <add name=”LyncExtReach” within the <system.applicationHost><applicationPools> section! 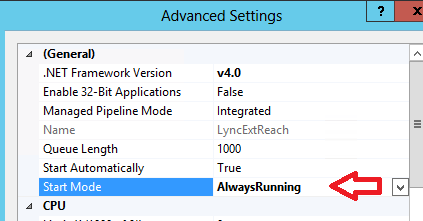 This entry was posted in Lync on March 17, 2014 by ArmgaSys. I have followed your steps but I dont see the start mode option at all. I am using WS2008 so what would the option be ? I couldn’t find a value for “start mode” either. Under general options, I see that we have only 6-options and the last one mentioned in your screen shot is missing. Is this screen shot from an enterprise edition FE? The original write-up was targeted for IIS8 / Server 2012 users. Unfortunately, we did a poor job of calling out the IIS8 requirement. We have updated the write-up to include instructions for those users running IIS7.5. Just thought I would search for this error again and found this site with the added information on how to manually solve it. SO far It is holding up. Thanks. The error came back on Friday. So after 24hours it re-occurred. I tend to agree that the error is based on the certificate used not being a SAN cert. I have both internal & external URL & and I am using a CA and the certificate used is one I created using the Internal certificate from the ( Internal Web URL ) I added the new servers to it webapps.local and webapps.domain.com to it) everything works but for the annonying error. Great write up exactly what i was looking for. One note you may want to include is Recycling the app pool. 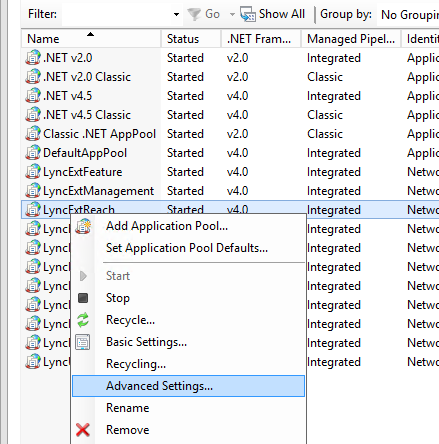 I followed the instructions above and it wouldn’t work after an iis reset until i recycled the app pool. Keep up the good work. i cant find the option through GUI and Manual edit also, am using windows 2012, but i cant find the option can help. below is the is the config. Anantha, I have got the same problem, but you have to find out first what is exact name of your reach application, go on first to IIS manager and you will find it there, when you open advance settings of reach app and the very first row is the name of your reach app.